A simple riddle from the first Harry Potter book. You are in a room with seven potions. There is a doorway ahead and a doorway behind, both engulfed in flames. Which potion will allow you to move forward to the philosopher's stone and which will let your friend back to safety? 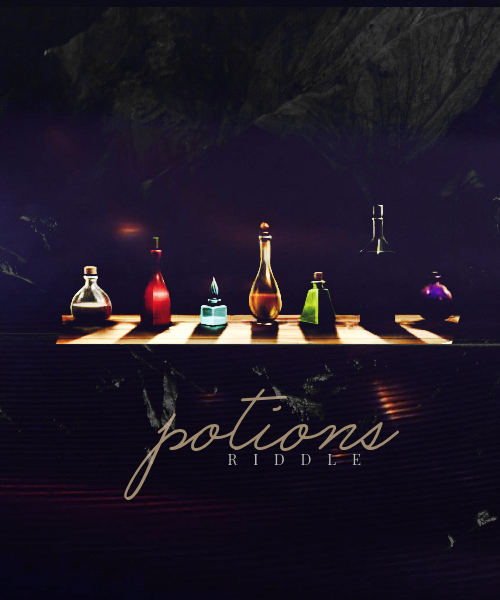 Poison, wine, potion to go forward, poison, poison, wine, potion to go back. Per clue 2, #1 and #7 are not the target potion. Per clue 1, #1 is also not wine, as there is no bottle to the left of it. #2 and #6 are neither the forward or backward potion as they are the same per clue 4, and there exists only one of each of those. Therefore they are either wine or poison. Clue 3 tells us #6 cannot be poison (it's the giant), both #2 and #6 must be wine. Per clue 1, this means #1 and #5 are poison. This means that #7 cannot be poison, as it must be different than #1, and cannot be wine, as both of those have been identified. This leaves only the backwards potion. #3 cannot be neither wine nor backwards (already identified), nor can it be poison (dwarf). It must be the forward potion! Only #4 remains, so it is the final bottle of poison. From clue 2, #1 and #7 cannot be Target potions. From clue 4, #2 and #6 also cannot be Target potions, as they are different potions and they are unique. This means Target potions can only be #3, #4, or #5, and the rest (#1, #2, #6, #7) can only be Poison or Wine. So we now have [P/W P/W T? T? T? P/W P/W]. From Clue 3, #3 and #6 cannot be Poison, so based on previous deduction, #3 must be a Target potion and #6 must be Wine. And since Clue 4 says #2 and #6 must be the same, that means #2 must also be Wine. Now we have [P/W W T T? T? W P/W]. Since there are only 2 wines in total, and we have identified all of them, that means #1 and #7 can only be Poison. And from Clue 1, a Poison must sit on the left side of every Wine, so #5 (and #1) must be Poison. That leaves the last potion, #4, which must be the second Target potion. So we have [P W T T P W P]. Not the answer you're looking for? Browse other questions tagged riddle logical-deduction or ask your own question. Riddle to code, What am I saying?